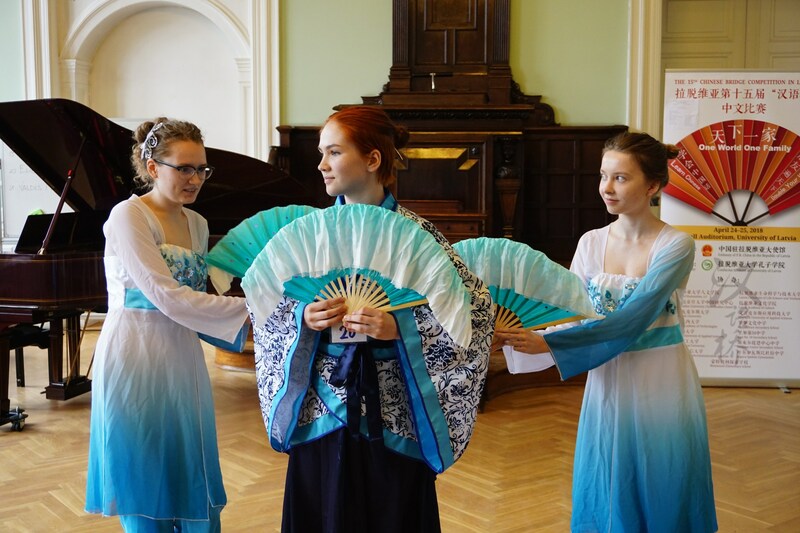 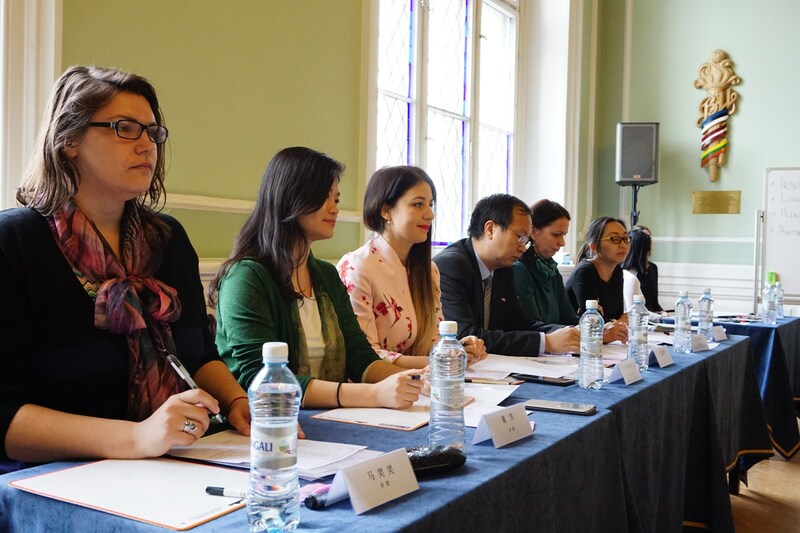 From April 24 to 25, 2018, the 15th “Chinese Bridge” Chinese competition in Latvia was held at the University of Latvia with the support of Hanban’s “Chinese Bridge” fund. 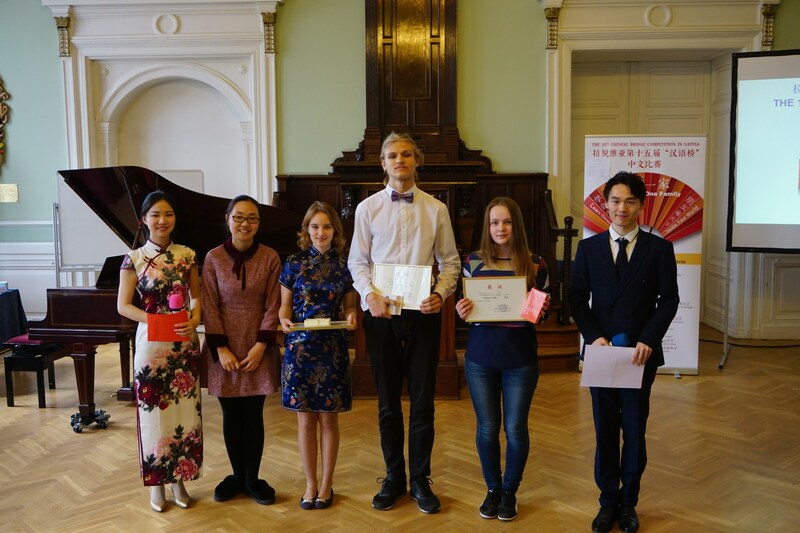 The competition was hosted by the Chinese Embassy in Latvia, organized by the Confucius Institute at the University of Latvia, Faculty of Humanities at the University of Latvia, Riga Stradins University China Studies Center, Riga Technical University, Transportation and Telecommunications Institute, Daugavpils University, Rezekne Academy of Technologies, Vidzeme University of Applied Sciences, Latvia University of Life Science and Technology, Latvian Academy of Culture, and Ventspils University of Applied Sciences. 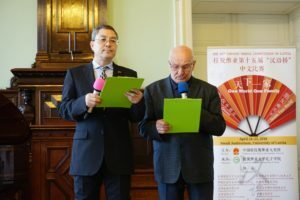 Mr. Sun Yinglai, Chargé d’affaires of the Chinese Embassy in Latvia, Counselor of the Business Office of the Embassy, Mr. Shen Xiaokai, Professor Pēteris Pildegovičs and Professor Shang Quanyu, Directors of LUCI, Chinese teachers, the representatives from press, universities and schools, and Chinese learners in Latvia, total of more than 200 people attended and watched the competition. 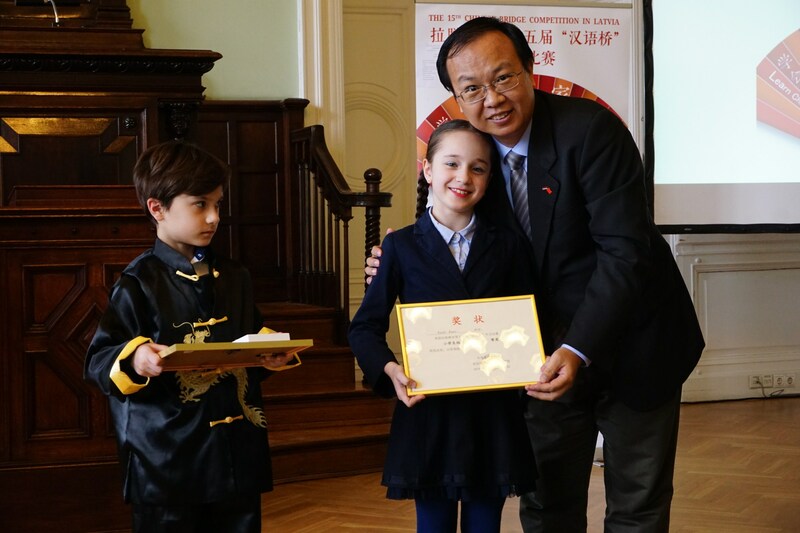 The number of participants reached a record high and the competition was a big success. 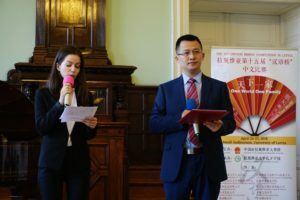 The Embassy Chargé d’affaires, Sun Yinglai, stressed in his speech that the theme of the event was “One World One Family” (university adult group) and “Learn Chinese Double Your World” (Primary and Secondary School), stating that the “Chinese Bridge” competition is becoming more and more popular in Latvia. Nearly a thousand learners have participated in the game for more than a decade. 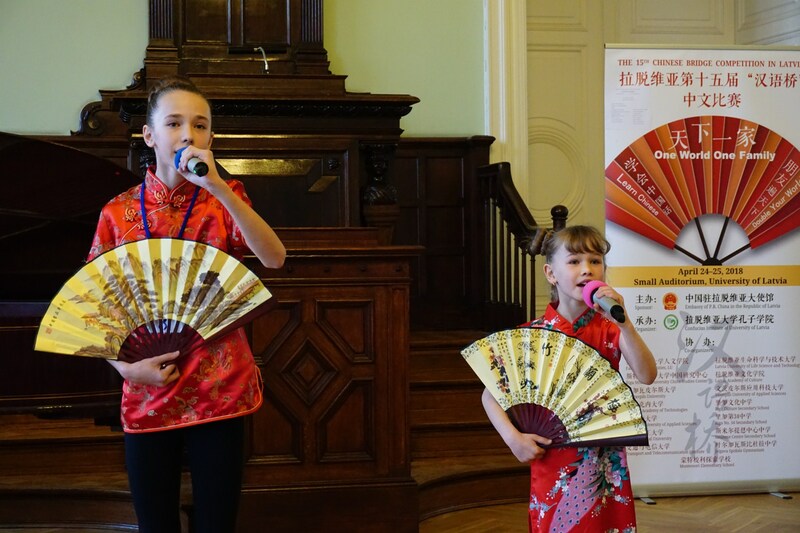 Everyone learns through Chinese language and not only has a glimpse of China’s splendid culture, but has also become a participant and witness of China and Latvia cooperation and friendship. 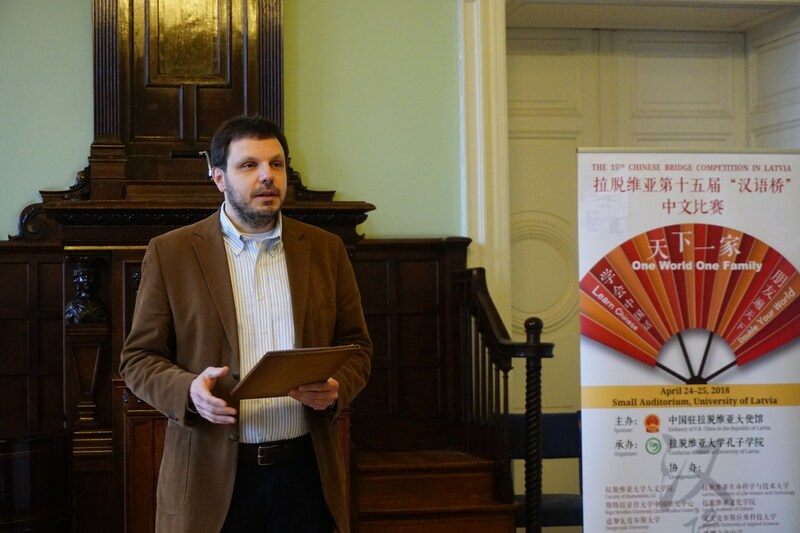 He thanks the government of Latvia and the University of Latvia for their contributions to the promotion of Chinese language and Chinese culture. 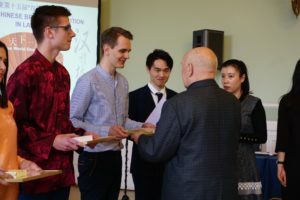 At the same time, he expressed encouragement and blessings for the contestants. Janis Ikstens, Vice-Chancellor of the University of Latvia and Deputy Rector of the Confucius Institute, mentioned that Confucius once said that “Wherever you go, go with all your heart”. His wisdom inspired us that learning Chinese is not an easy task, but as long as the learners are full of enthusiasm and wholehearted efforts, they will certainly succeed. 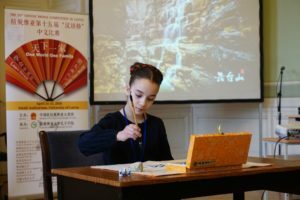 The Chinese Bridge Competition is a party that can make friends from all over the world, at the same time, it is also a fierce competition. In the competition, the players can temper their skills, show off themselves, and learn from each others. 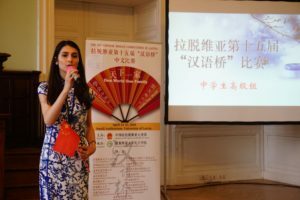 It will surely be a rewarding journey. 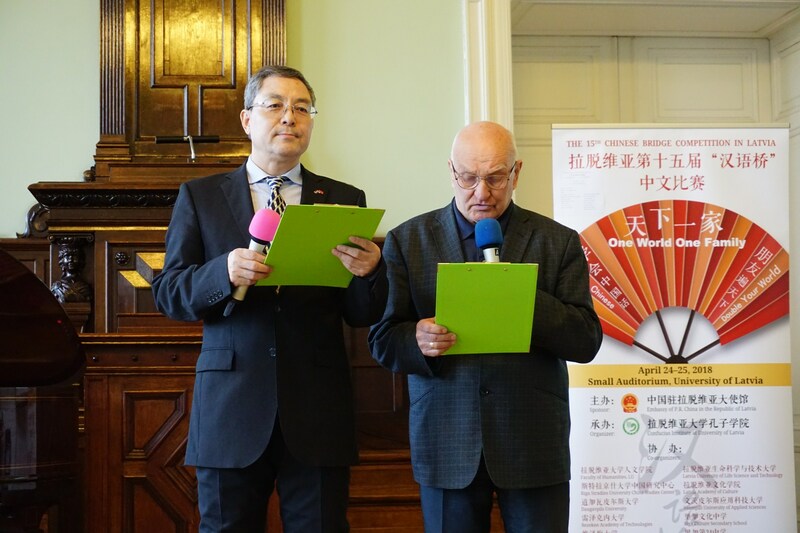 Professor Pēteris Pildegovičs and Professor Shang Quanyu, the Latvian and Chinese Directors of the Confucius Institute at University of Latvia, mentioned in the speech that the biggest highlight of this year’s Chinese Bridge Games is that juveniles and children compete for more and more young people. 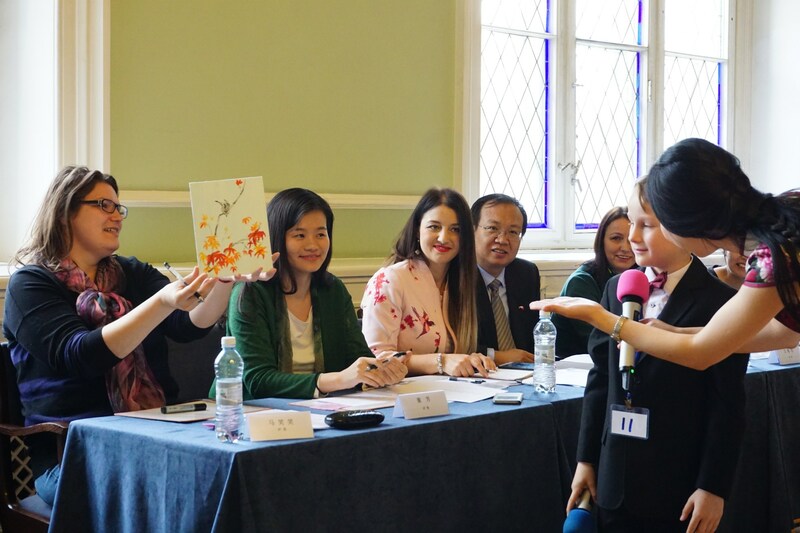 It shows that the Chinese language and culture are loved by more and more young children, and their future is bright. Confucius Institute at University of Latvia will continue its efforts to promote Latvian’s Chinese teaching. 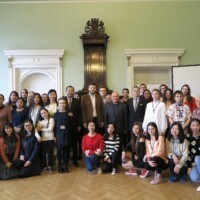 There were a total of 68 participants in the Chinese Bridge, including 17 in the adult group, 32 in the secondary school, and 19 in the elementary school. The contestants competed fiercely through four links: self-introduction, topic speeches, Chinese cultural quiz, and talent show. 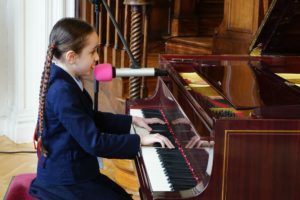 Their passionate speeches and well-prepared talent shows have impressed the judges and guests. 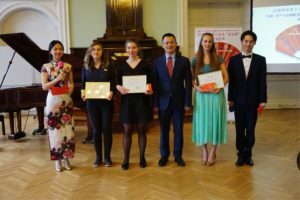 Finally, Michelela Belkina and Ziedkalna Nora of the University Adult Senior Group are tied for the first, and Juksinska Anastasija and Elizaveta Bogatova respectively won first prize for the intermediate group and the junior group; Eriks Kasparenokes, Galeja Sabine Madara and Onzule Laura won the first prize in the senior group, intermediate group and junior groups of the middle school group; Korali Anais, Marija Nilova, and Timurs Maksimovs won first prizes in the Senior, Intermediate, and Junior groups of the primary school group. Some of the winners will represent Latvia on behalf of Latvia to participate in and observe the 2018 “Chinese Bridge” Universities and Middle Schools Students Chinese Competition, interact with excellent Chinese language learners from all over the world, and obtain the priority of the 2017-2018 Chinese Government Scholarship. 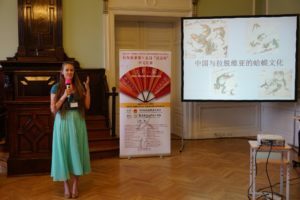 As the center of Chinese teaching in the Baltic region, Latvia has made remarkable progress in Chinese teaching in recent years. The promotion of Chinese language is flourishing. The successful completion of the 15th “Chinese Bridge” Chinese competition once again pushed Latvia’s Chinese language promotion to a new height, and the cultural exchanges between China and Latvia will be further strengthened.